Montreal Comiccon came and went, and with it its artists, panels and vendors. I thought the convention wouldn’t have that much eSports content, so I went in with the intention of seeing all of it. But I was dead wrong. There was a lot of eSports content this year, thanks to the eSports zone. 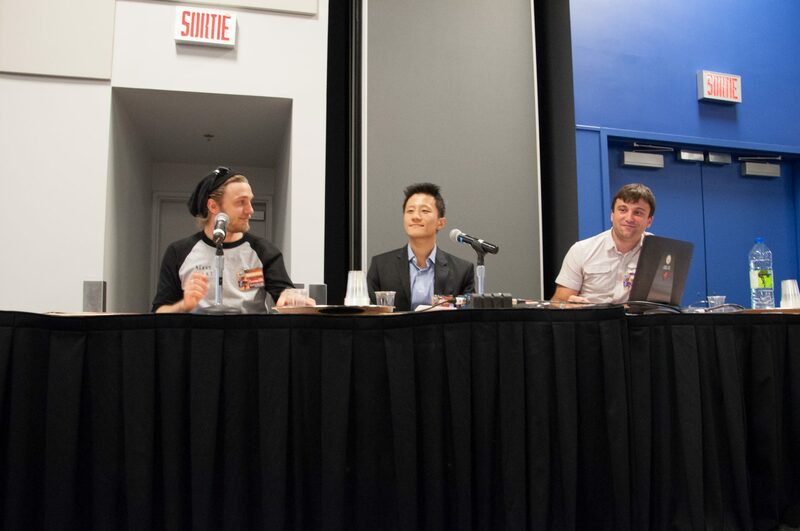 I attended these panels: “eSports 101”, the launch of the Fédération Québécoise de Sports Électroniques, “eSports Talk with Montreal Gaming”, “Les Sportifs du Clavier live: Les eSports, bien plus que des jeux” and “Débat sur le E-Sports”. So while I won’t go into minute details about each event, I’ll try to give my opinion and views on each and explain them quickly. Overall, I have to say that I enjoyed the convention. The eSports zone was pretty well situated, was quite spacious, and was organized in a good, if not efficient, manner. I personally had some reservations about certain aspects of the room, but I’ll come back to that later on. 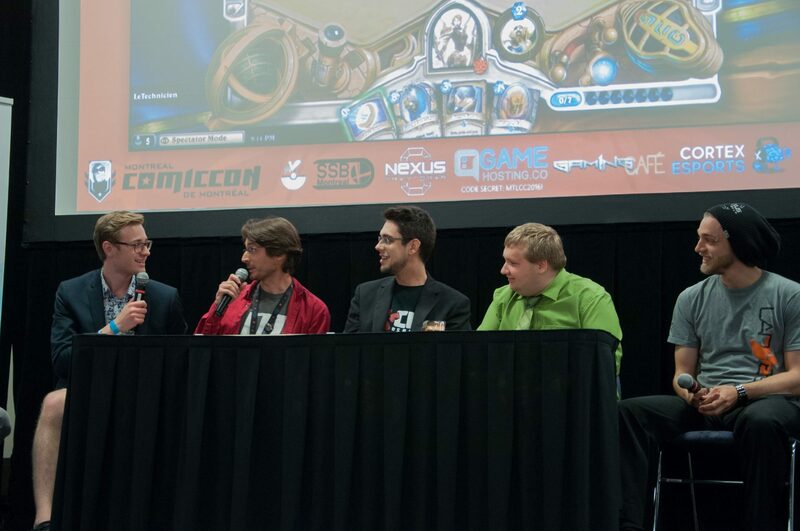 The first panel I attended was eSports 101, which I enjoyed greatly. The three people presenting had a great amount of knowledge and experience in eSports. Mikäel Daudignon is one of the most experienced members of the scene, having seen it grow in Europe before it moved to North America. Dawei Ding is a lawyer and former professional pro gamer, giving him a perspective few have. Finally, Vincent Doré-Millet is a former caster and member of the Lan ETS committee, and now gaming bar owner, making him a great person to present more of a consumer/spectator point of view. They gave a great presentation about eSports as a whole, explaining to the newcomers what it is and how it works. Although they didn’t go too deep in the subject, being pressed for time, they did an excellent job and achieved their goal of teaching the public about the scene. They were amongst my favourite presentations of the weekend. The second event of the day, and one of the biggest of the weekend, was the launch of the Fédération Québécoise de Sports Électroniques. They explained their goals succinctly: support young entrepreneurs and players new to the scene, promote eSports in the mainstream media, support different eSport events, and support different eSport projects in schools. They talked about the different projects they have already set up: the fight about the exclusion of the province of Quebec in most tournaments, the recognition of eSports as a sport by the government, and eSports at the college and university levels. The event went pretty smoothly, but it did raise as many questions than it answered. While they offered to answer any questions offstage, I think it would have been a good idea to offer a question period, so everyone could get the same answers at the same time. My other small issue with the event was the lack of lighting on the stage, making it almost impossible to see the panelists. I found this unfortunate, since it was the official launch of the organization. 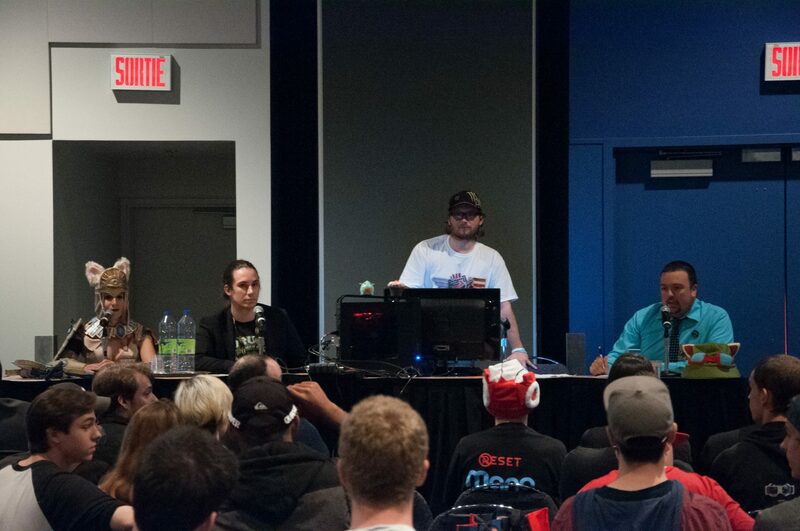 The eSports Talk with Montreal Gaming was incredibly confusing for me. Granted, one of their panelists was missing, but I couldn’t understand how their panel was structured. It started with P-O Crépin, a former pro gamer and now team manager, walking us through his career and talking about the high points of it. While I found it very interesting, I would have very much liked to hear more about the efforts, sacrifices and compromises he had to make to get to where he is now. I felt his talk was missing a clear goal, but I still found it quite interesting. Joey Luckes, CEO of Montreal Gaming, was in charge of the second portion of the panel. This presentation was the most confusing of all for me. It seemed to be about eSports as a whole, its growth and market value. It ended on a short talk about Montreal Gaming’s website and an invitation to help and get involved, both in the scene and the website, I assume, but I’m not quite sure. Here’s what I found particularly strange: the name of the panel was in English, the first presenter did his part in French, and now, the second presenter is also speaking in French, but his PowerPoint is in English. I still don’t know what to make of it. Not only that, but while the presentation itself was okay, I again didn’t see a clear point or goal behind it, and this whole panel left me confused and bewildered. I will also point out that, once again, the stage was completely devoid of lights, making it incredibly difficult to see the panelists. Going on to the next panel from Les Sportifs du Clavier. I have to say, this panel was hands down my favourite of the whole event. This organization brings news and their opinions about the esports scene, both international and local, in a weekly podcast presented in French. Their panel was actually their podcast, shortened for the sake of the event, live in front of the audience. The whole panel was engaging, informative and just pure fun. They interacted directly with the audience, asked for everyone to vote on different questions and subjects, and did a giveaway at the end. I highly recommend any of our French-speaking fans to go check them out, they are well worth the listen. Should the different leagues be mixed (men/women) or separated? Should there be sanctions against players using illegal substances while playing? For or against the ban of Team YP, sponsored by YouPorn, from ESL’s tournaments? For or against betting in eSports? In my opinion, most of the questions were good, and their answers were also quite good. The panelists were divided into two groups. The first group answered the first three questions, and the second group answered the last three ones. I think the panel was a success, but I do have to raise certain points and problems about it. No pro gamer, and no women? My first issue is the lack of an active pro gamer. The panelists covered the different aspects of the industry well, but there was no pro gamer, something I found unfortunate. My second point was the lack of female presence on the panel, especially during the first portion of the debate. They raised the question of mixed leagues, yet there was no woman to answer it. My last point is about something that really shouldn’t have happened. While the stage was perfectly illuminated, something weird happened on the giant screen in the back. Early during the panel, the standard eSports zone background was shown. But at some point, a game of Hearthstone appeared on the screen. At first, I thought it was a rebroadcast of the weekend’s Hearthstone tournament, and while it would have been incredibly strange, it would have made sense. But it was actually one of the technicians playing Hearthstone. Now, I have nothing against wanting to play some Hearthstone. The weekend was long and exhausting, so if someone wants to relax and play some games, I’m all for it. What I am completely against, though, is having your game shown behind an event happening in front of an audience, and continuing after some people called it out. It is, in my opinion, simply rude and completely unprofessional. The panelists deserve to have all of the audience’s attention. Having something like this happening in the background is distracting and can be quite annoying. Still, for the most part, my weekend at Montreal Comiccon 2016 was a great experience. I met a ton of people, and got to hang with some friends. I also brought home some great art and learned a few new things. I’m looking forward to what next year will bring. As for me, DreamHack Montreal will be the next eSports event that I’ll be attending, and I can’t wait. 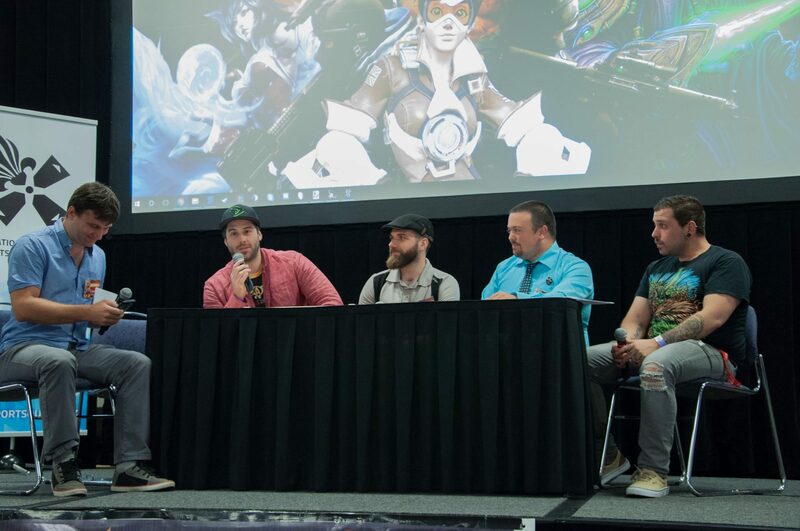 Editor’s note: The images pertaining to the “eSports Talk with Montreal Gaming” panel have been removed as per the request of Joey Luckes, CEO of Montreal Gaming.